The Porsche 912 has never been the most beloved Porsche. Many didn’t even consider it a Porsche, as they thought the one and only Porsche was the 6 cylinder Porsche 911. However, nothing’s wrong with the 4 cylinder powered Porsche 912. After all, weren’t the predecessors of the Porsche 911 not all of them 4 cylinder powered? The Porsche 356, or the cars that gave Porsche the first real successes in international motorsport, like the Porsche 550 Spyder or the Porsche 718. After the story of the Porsche 356 came to an end, the Porsche 911 was born. However, the life of the Porsche 356 was prolonged with a year because the sales of the Porsche 911 weren’t exactly the way Porsche AG had expected it. Many of the customers thought the Porsche 911 was too expensive, and they were a bit suspicious about the 6 cylinder engine. Why would one change the concept of the 4 cylinder, that had proven it’s reliability. So Ferry Porsche himself decided to build a light-weight Porsche 911. The new model would get the body and chassis of the Porsche 911, and the somewhat cheaper 356 engine would be implanted in the back. The Porsche 912 was a sales success, for each Porsche 911, there were 2 Porsches 912 sold. At the end of 1969 no less than 28333 Porsche 912 Coupes were sold, and 2562 Porsche 912 Targa’s. And exactly these sales numbers saved the company. The Porsche 912, nicknamed ‘the Lady’ or ‘little brother’ made that the figures of the company turned green again. Jürgen Lewandowski, a renowned automotive journalist, and author of more Porsche books, grab the occasion of the 50th birthday of the Porsche 912 to study it’s history. The result of his study is a detailed book with lots of stunning and never published before pictures. 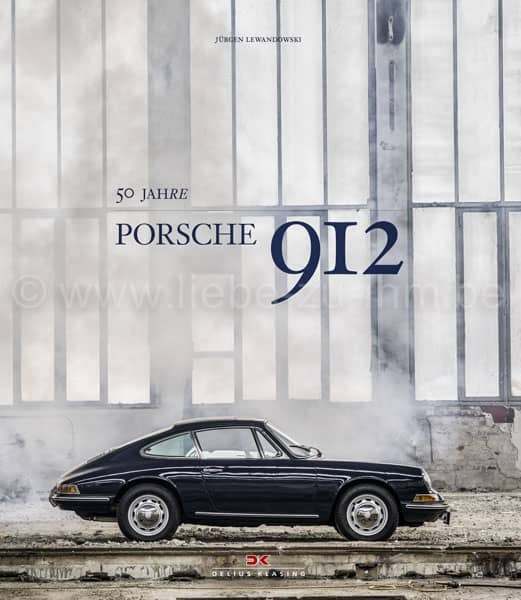 In over a dozen of chapters, Jürgen Lewandowski tells of the complete history of the Porsche 912. Lots of facts and figures you never heard about are explained, and a complete chapter goes to the Porsche 912 Prototype. Available in both a numbered and limited edition (912 ex ) and an unnumbered and unlimited edition.